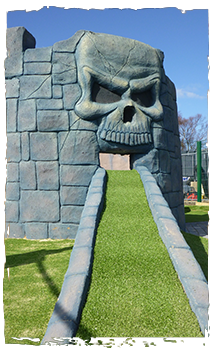 A 12 Hole Pirate Themed course that is heavily themed incorporating a number of large ‘stand out’ features including a large waterfall and Jail and lake, a sunken ship with cannon splash, and a ‘scull’ cave. Keen to establish a bespoke attraction the course incorporates a number of new and unique hole designs. The course incorporates a Kiosk and decked area linked to a dedicated party room. In addition a working pirate ship was included to transport players across the lake and in conjunction with a number of interactive features including stocks and a pirate graveyard. HM Adventure Golf were appointed as Principal Contractor under a standard JCT Design and Construct contract. We delivered a turn key service including a full design service, Project and Cost Management and also the Principal Designer (CDM) service. The course was built alongside the construction of a new Golf Course which threw up a number of logistical challenges. In addition the programme was extremely challenging both commercially and construction wise. HM AG were appointed on Christmas Eve and commenced work immediately on 4th January before formal contracts and in the spirit of goodwill. The project was successfully delivered despite the rigours of the weather in winter time and within a challenging project timeframe of 11 weeks which was accelerated by the Client to achieve an Easter opening. This was a spectacular achievement given the location, the features and complexity of the course.